1 ½ tbsp. Vegetable Oil. 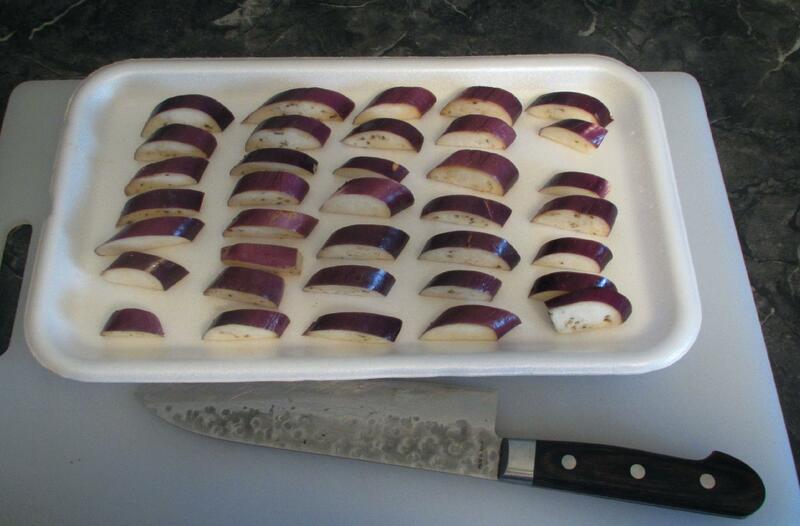 Slice the eggplant lengthwise and then across into half-moons about ½ an inch thick. Toss the pieces with lemon juice and salt. 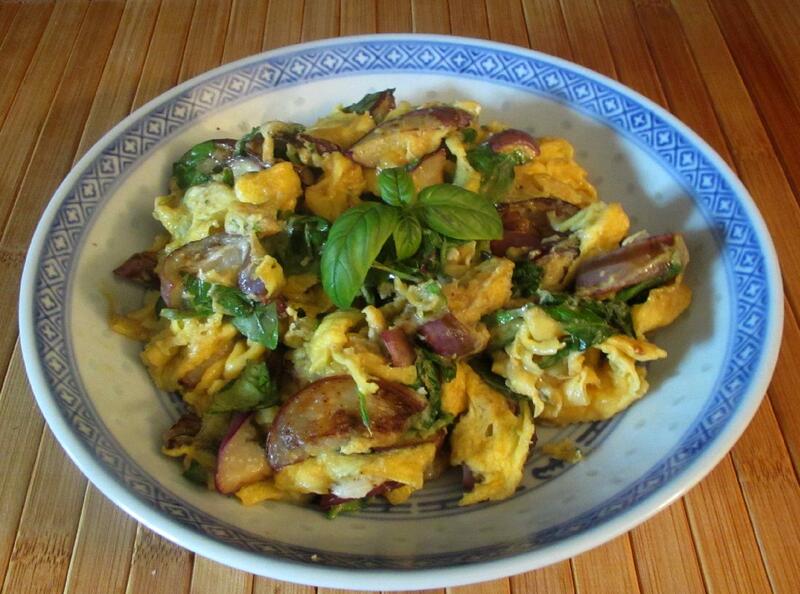 Beat the eggs in a bowl together with the cornstarch slurry then stir in the sugar, fish sauce and white pepper. Set aside for the moment. 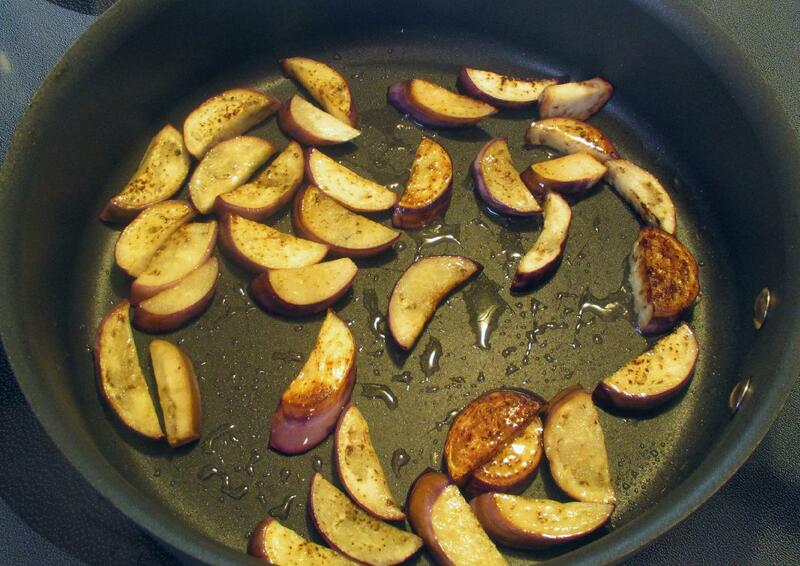 Heat the oil in a pan over moderately high heat then quickly sauté the eggplant pieces until they begin to turn golden. 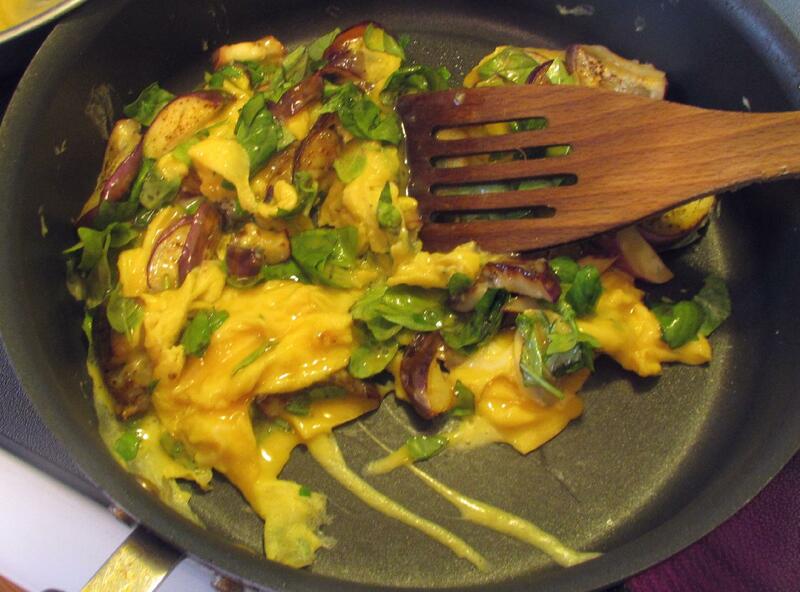 Pour in the egg mix and scatter the basil over top of everything. Allow the eggs to just begin to set at the bottom of the pan for a few seconds and then begin to turn the mix very slowly, one area at a time, breaking the thickening egg mixture into fluffy ‘curds’. 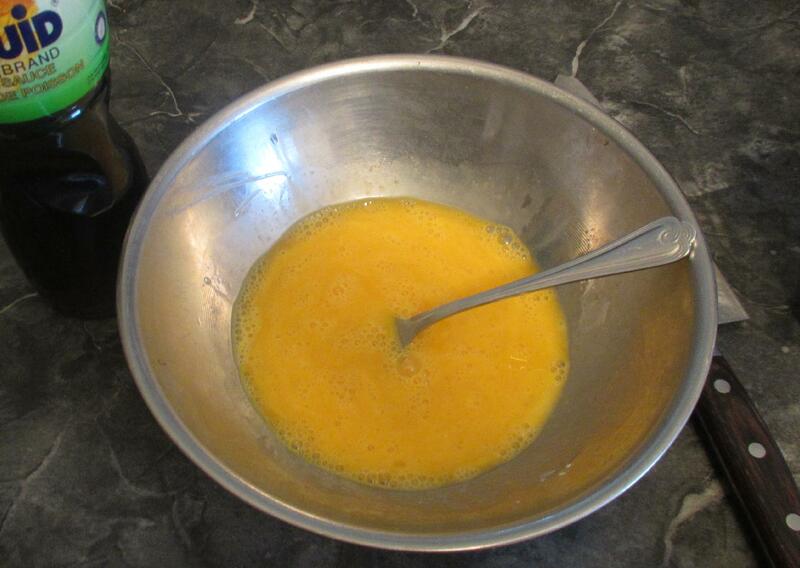 When the eggs are more or less completely set, turn the mix onto a plate or plates and serve immediately. 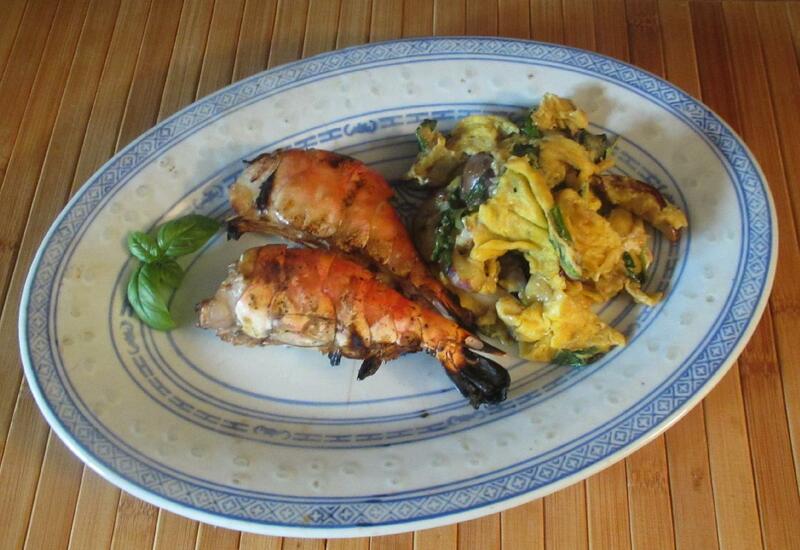 I served this batch as a side to some giant shrimp barbecued with a little chili oil and cumin. My wife really liked the eggs dish quite a lot but, while I thought the flavor was very nice, I wasn’t all that keen on the overall texture combination. This was an interesting idea but it will need some tweaking before it would be something to add to my repertoire. Hi John, thanks for sharing another experiment with us. Perhaps it would help to dice the eggplant for a more uniform texture. Peeling the eggplant could also be worth trying. Mmm, that looks really good! I’m going to try that! Actually, the texture issue was really just a matter of personal taste rather than an objective assessment. My wife liked the dish just fine….